Whether a profitable committee or a non-profitable one, every committee needs an effective agenda templates to accomplish their certain targets in a respective manner. 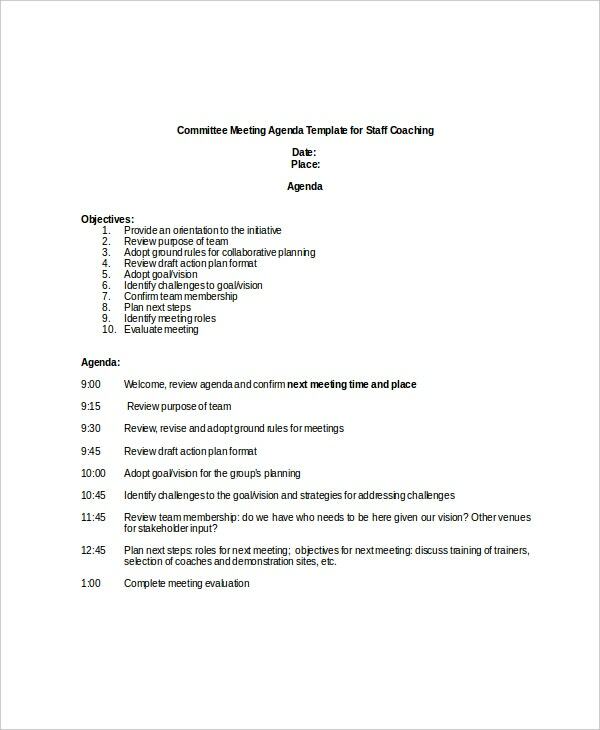 Creating a committee meeting agenda template means you are making a road-map with certain outcomes which will keep in mind during the meeting to make the agenda successful. 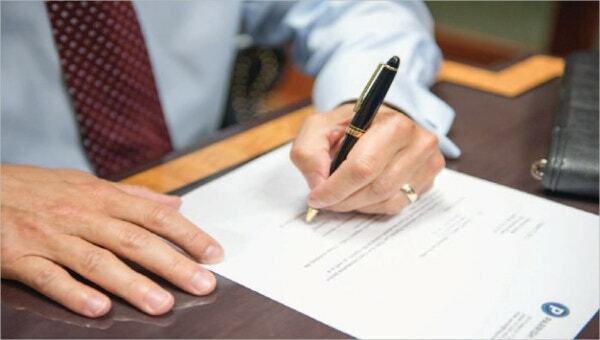 To cover the objectives in a timely manner, a committee meeting agenda should organize with the clarity which includes straight line statements. You can also see School Agenda Templates. 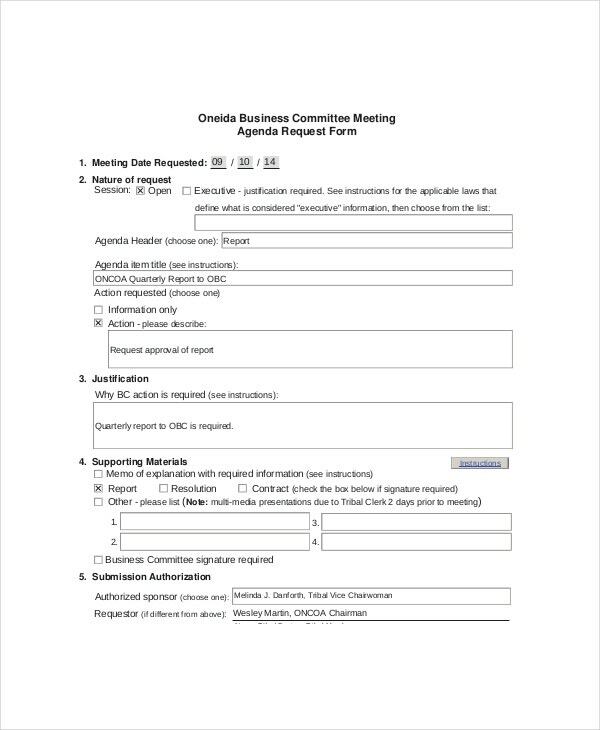 A business committee meeting is a gathering of business departments as well as groups which are working to meet the target that is explained under these templates. 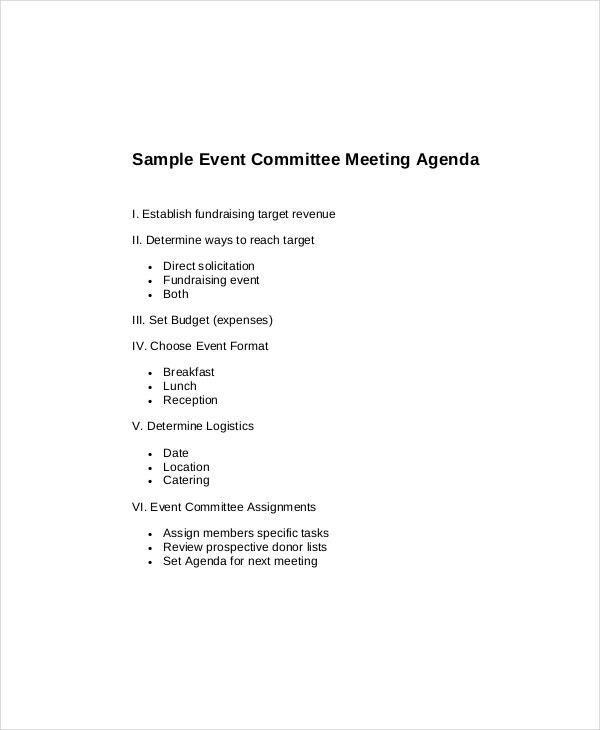 In these templates, planning for a business committee to accomplish their targets is mentioned. Any modification as well as alteration can be easily brought about to make the meeting more profitable. 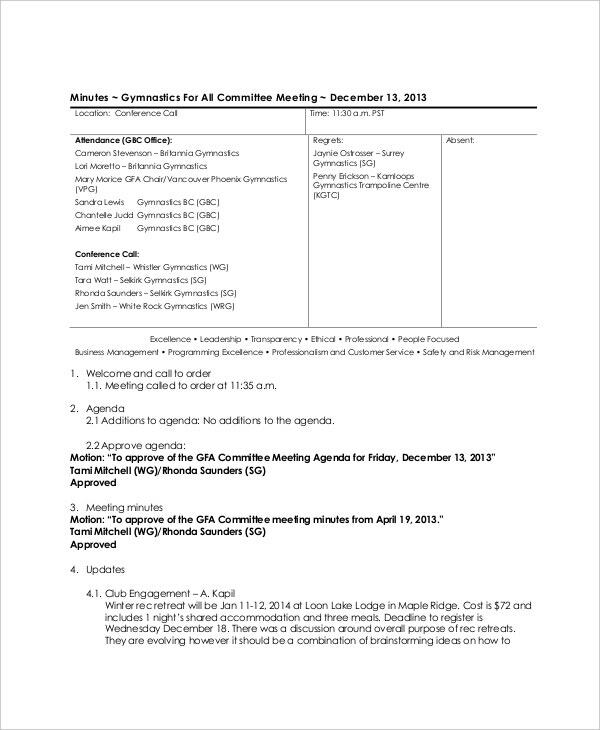 General committee meeting agenda template includes all the general points of any information, norms, even otherwise to create some guidelines for some particular object. 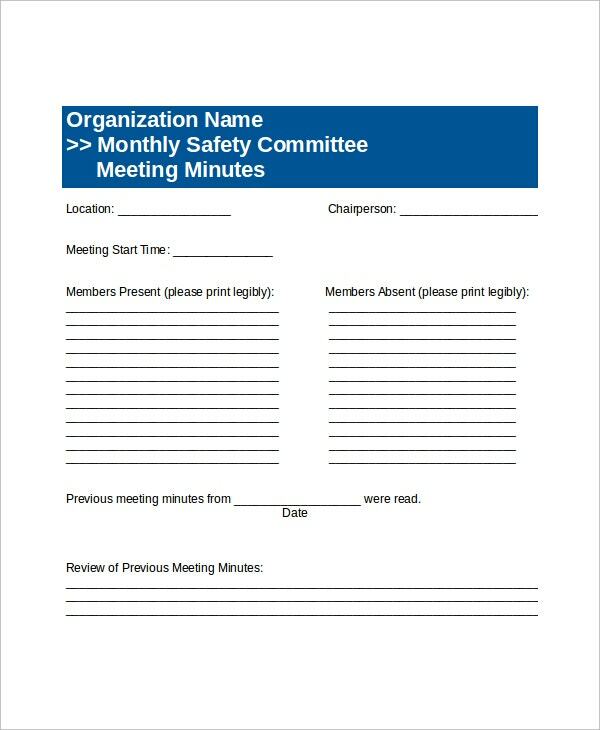 In these agendas, this guideline is a short list of any analysis of minutes which belongs to the committee or sub-committee. This is a weekly gathering program of any committee to discuss some certain guidelines. 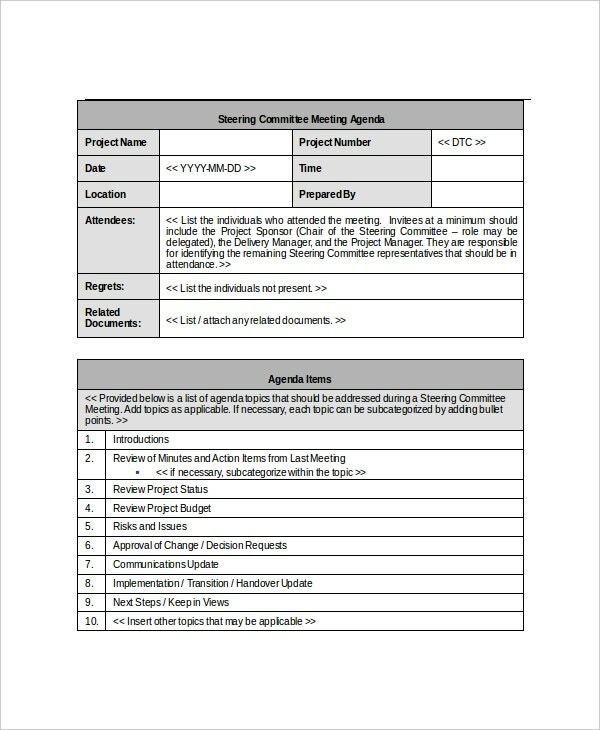 These guidelines are presented from the committee meeting agenda templates which are prepared according to the productive planning of this committee. These Agenda Templates is not only for the week but also for the upcoming series of this meeting. The main reason behind the creation of this group template tells the requirement of this committee. 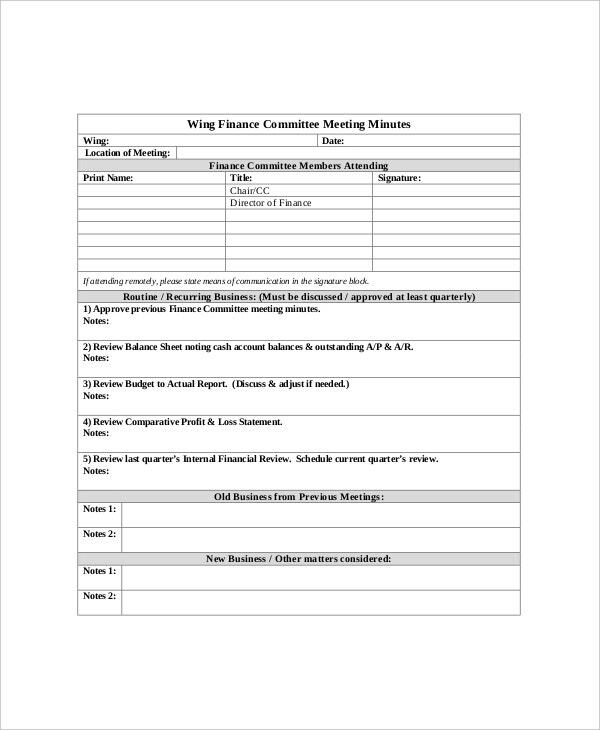 The sales committee meeting agenda template is a meeting booster which is specially designed to increase the turnover as well as its other aspects. This agenda presents a guideline for sales and distributor department to discuss in the upcoming meeting. 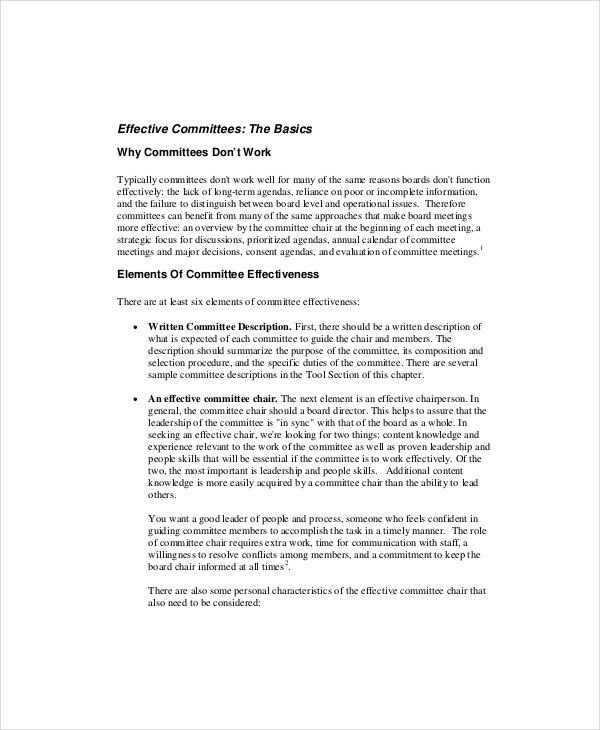 To get an effective committee meeting agenda template, one should keep in mind that the only target of this agenda is to make the meeting straight forward as well as maintain its purpose properly. An effective agenda helps to take any crucial decision with the majority of members. It is a guideline for the committee members to make the meeting victorious. You can also see Blank Meeting Agenda Templates. If the majority of people work together to meet a certain target, then that is called committee. 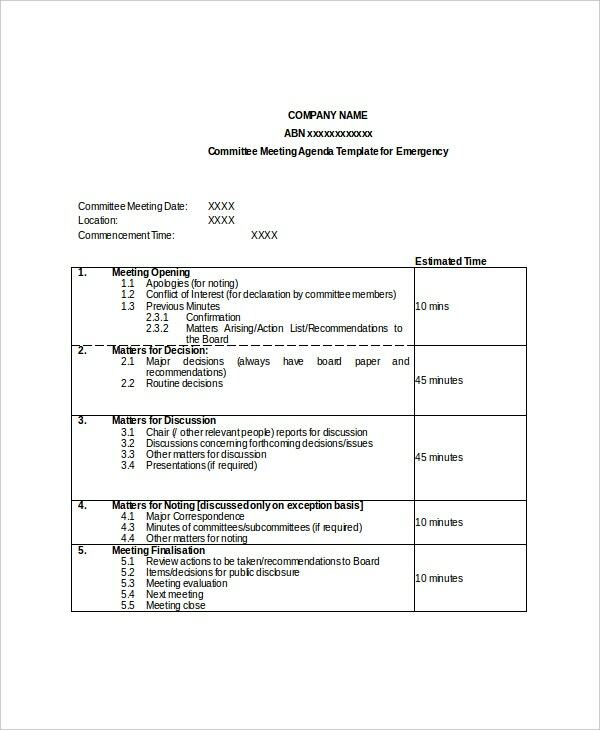 The committee meeting agenda template is a complete guideline which includes all the major points to discuss to make the upcoming meeting meaningful. The agenda template should be easy to access as well as understand for ordinary people of the committee. 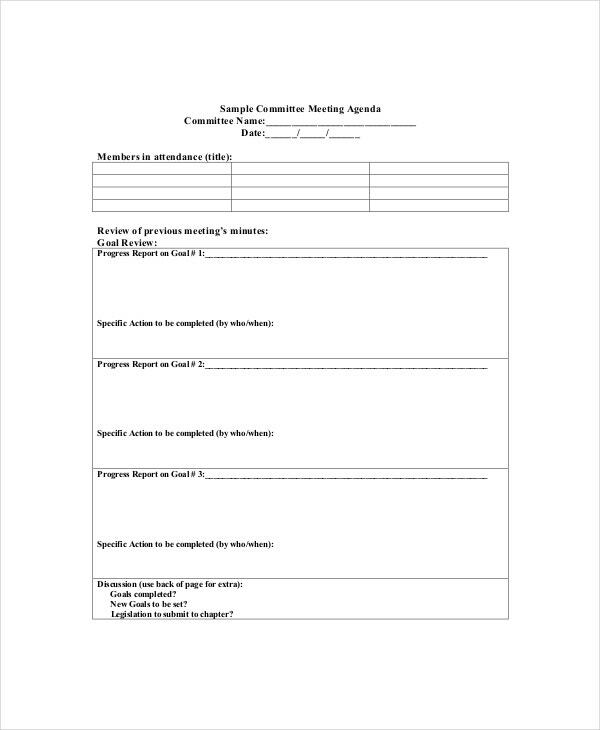 The size and nature of the upcoming meeting can be predicted from this committee meeting agenda template. All the upcoming circumstances of any business can be planned accordingly. It speaks about the needs and requirements of various committee meetings. 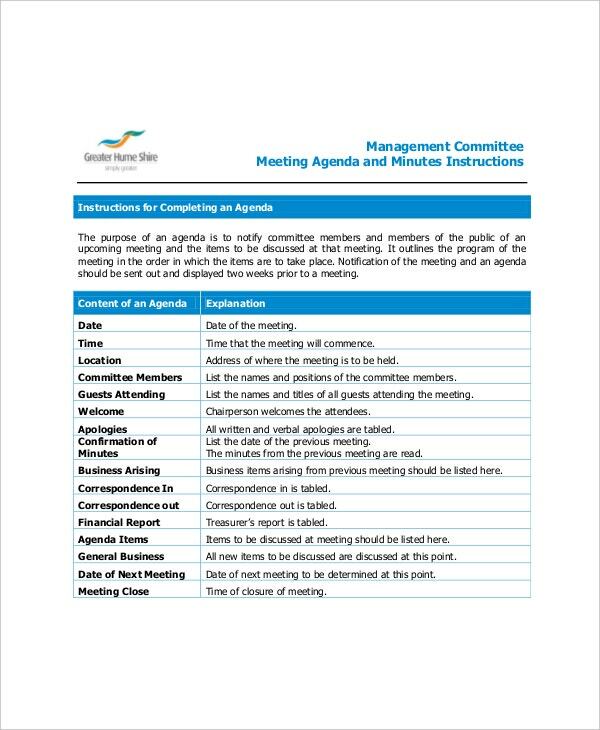 The agenda template is useful not only for formal meetings but also for informal meetings. 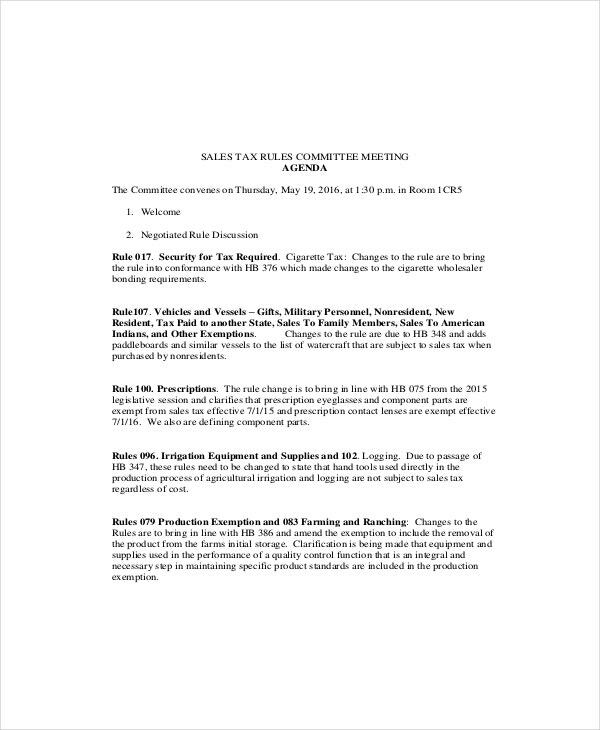 In a committee meeting agenda, firstly, mention about the previous data and minutes of meeting if any. 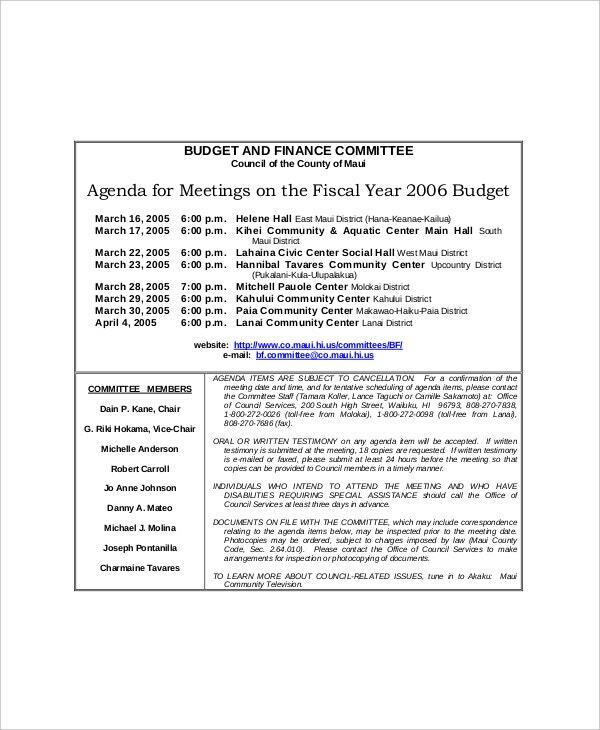 Name of the committee members, as well as, the attendees should be well mentioned in this template. It should cover all the important circumstances related to this upcoming meeting. The duration of the meeting clearly specified. 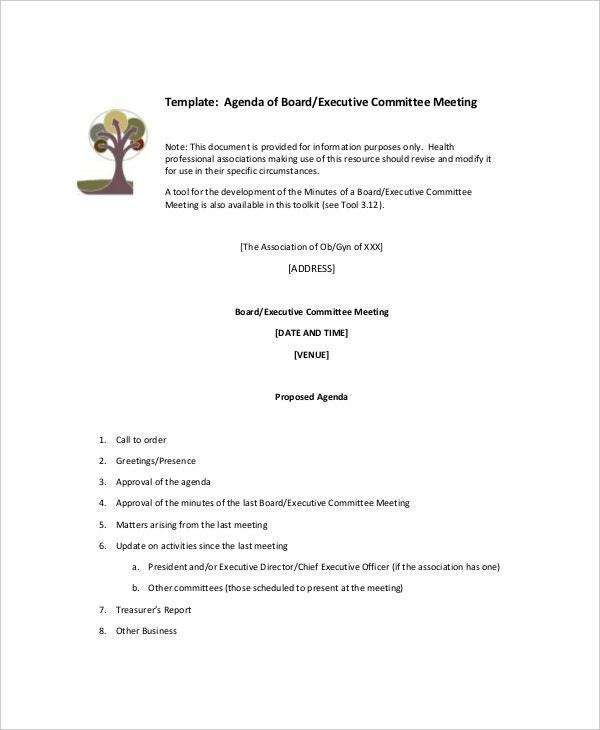 We provide plenty of designs for committee meeting agenda template which includes the quality statement as well as sufficient data. These templates can be easily downloaded from either word documents or PDF files which work in a faultless manner. Any amendment in this format can be adjusted accordingly. The blank columns can be fulfilled effortlessly. You can also see Agenda Planner Templates.